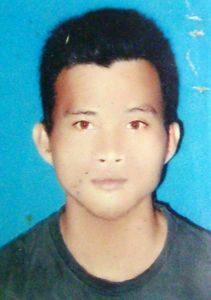 LAHAD DATU: Salomah Hamad, 30, is the heartbroken mother of 7-year-old Haikal who was slain by his father last week inside the living room of an unnumbered wooden house belonging to her adopted parents in Kampong Ipil. During an interview, Salomah, holding a small photo of her son taken when he was aged two, said her 35-year-old husband was a drug addict. She believes that syabu caused him to lose his mind to the extent of slitting the throat of their only son and then allegedly drinking his blood. 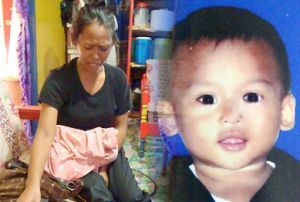 “Syabu killed my son … my only son!” she cried. Raising her voice and cursing her husband, the young mother hit the wall of the same room her son was killed in and demands that the authorities release her husband, Salimar Hamad, to her so that she can do the same to him to revenge her son’s death. Her adopted father, 56-year-old Nasir Bin Isunu and his wife talk soothingly to her as she works herself up until she’s nearly catatonic. When she regains a semblance of calmness she reveals that her husband had worked as a driver at a construction site in Sandakan. She said this was not the first time that her husband had displayed such bizarre behaviour while under the influence of amphetamines. Syabu, she said had led him into a state of demonic possession many times before. “In fact he had such a demonic attack in Sandakan near noon that day. He took a knife and sat inside our relative’s home near ours all the while making odd sounds while holding the knife in his right hand and pointing a finger angrily at anyone who dared approach,” she said. Recalling the morning of the killing, Salomah said it was like any other. She woke up early and told her husband to quickly go to work but he was still under the influence of the drug and refused to get up and said he would go to work in the afternoon. She said she then left for her relative’s house not far away with her four young daughters and Haikal. She returned home at around 10am to prepare lunch for her children. As her husband was still in the bed, she said, she insisted he get up and go to work or he would be fired by his employer. Surprisingly, he did so, first taking a bath and then departing. “My son soon came to me and said father had forgotten to take his keys and wanted me to look for it and bring it to him while he waited at the relative’s house. “I couldn’t find the keys so I went to look for him with my son. When we reached there we saw our relatives fleeing their house in fear. “When they saw me they quickly told me that my husband seemed possessed and was holding a knife. When I went in I saw both his legs shaking vigorously. He wanted to speak but could only make an “um…um” sound. I was terrified when I saw him holding the knife, but I no choice but to steel myself to calm him down,” she recounted. When he finally calmed down, she said, he grabbed Haikal’s arm, refusing to let go and then suddenly picked up the child and ran out of the house. She said she panicked and gave chase with her relatives but he managed to elude them inside the squatter colony. “We searched everywhere, even at the long-distance bus station and into the night but we couldn’t find them. Later I received a call from my adopted parents telling me that my husband and son were in their house. “Since it is still the Hari Raya season, I thought they had gone there to celebrate with my adopted parents. I felt so relieved and went back home to look after my four young daughters. However, at about midnight she received the call that has turned her world into a nightmare. Its been a week and Haikal is still not buried. Salomah is upset. “We are Muslims and strictly follow Muslim customs … my son suffered a lot, please don’t let my son suffer more in the ice box … let him lie in peace and with Allah,” she sobbed. Salomah’s tale hides another painful truth. When Project IC started in the late 1980s with the aim to topple the Parti Bersatu Sabah government, the influx of Muslim immigrants from the Philippines to Lahad Datu also opened the door to another menace – syabu, or more commonly known as ‘ice’. It is well known that Kampong Ipil is one of the many water villages that is flooded with this synthetic drug. For a long time drug pushers openly peddled syabu and only when amphetamine was classified under Dangerous Drug Act (DDA) in 1997 did it go underground. Kampong Ipil has been classified as a Syabu ‘black area” but this has not detered drug pushers from going about their routine in the kampong. In 2006 and 2007, an all out war against drugs was announced after the authorities realised the seriousness of the syabu threat following a series of violent crimes especially in the peninsula. But it has wiped out the threat. Today, drug pushers in Kampong Ipil have moved deeper into the village and operate at night. If one is seeking, seemingly innocuous torchlight signals can be spotted guiding vehicles towards the source.